Causeway empowers associations to create unlimited workgroups for their committees, boards, teams, and task forces. Each workgroup has its own membership roster and contains a secure area for sharing files, engaging in discussions, sharing calendars, creating wikis, voting on ballots and surveys, tracking task progress, and more. Workgroups can be open to all members, restricted, or hidden and accessible via invitation only. Content created in one workgroup can easily be shared with other workgroups, either as read-only or with full editing rights. Individuals contributing content to a workgroup can check a box to notify their colleagues about the update using the workgroup's built-in mailing list. They can also email the workgroup any time using their preferred email application or through Causeway's web-based discussions interface. Workgroup members can be assigned various roles including Chair, Administrator, Event-Scheduler, or custom roles can be created by selecting any combination of ~75 different permissions. 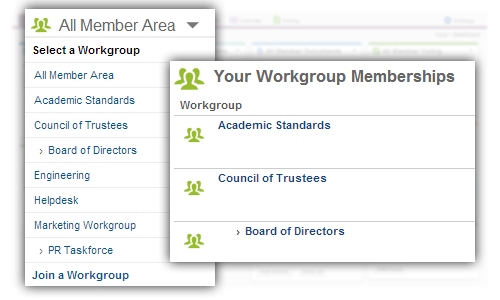 Workgroup Chairs can easily manage their groups' rosters, documents, and calendars.